Attorney Regina Quinn of The May Law Firm, PLLC, moderated the May 12 forum. 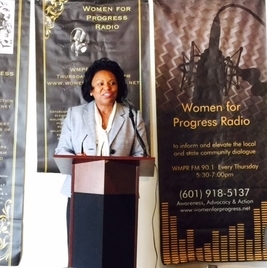 Thanks to Candidate Eddie Jean Carr for spending the hour with Women for Progress, sharing the accomplishments of the office of Chancery Clerk and if re-elected, her plans for the future administration. Mrs. Carr has 11 years as Chancery Clerk for Hinds County and states that she has a longtime commitment to Hinds County as a 44 year resident and committed public servant. Moderator: Ms. Toni Johnson, Community Activist and President, Infinite Consulting, LLC.